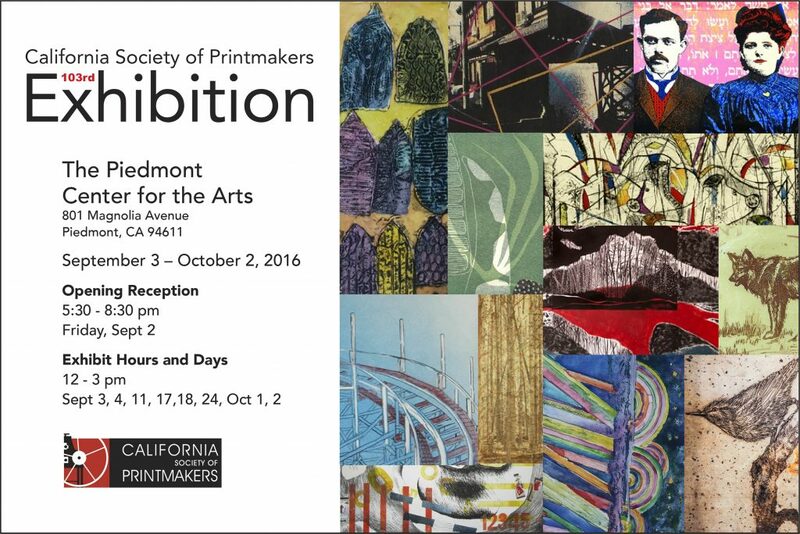 This is always a very interesting show of contemporary prints by members of the CSP. My image is the red, black & white one in the middle of the card. My print, Oil Spill 21, is on the cover of the May 2016 issue of Art Opportunities Monthly. 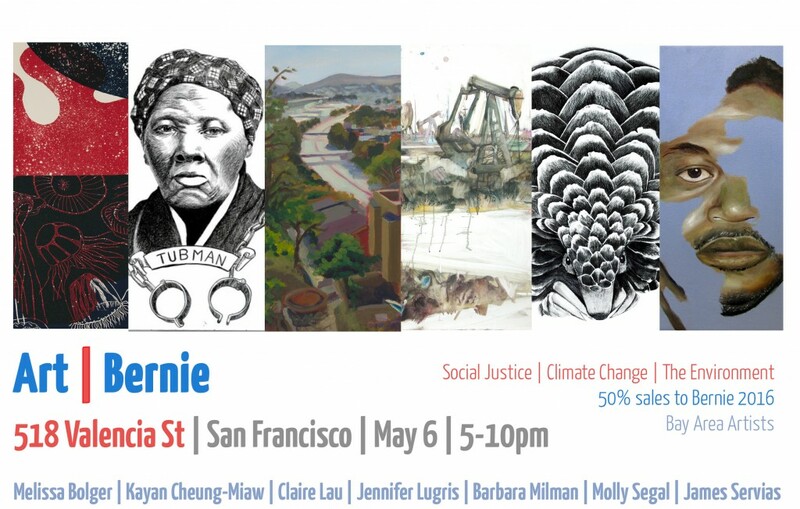 On May 6 I will be participating in a fundraiser/ show in San Francisco for Bernie Sanders. I hope lots of supporters of Bernie will show up – and also anyone else who is interested. Everyone is welcome – you do not have to make a contribution (all contributions will come from the purchase of artworks). I will have a solo show in the Hallway Gallery at theFirehouse Arts Center in Pleasanton, CA from May 3 to June 2. 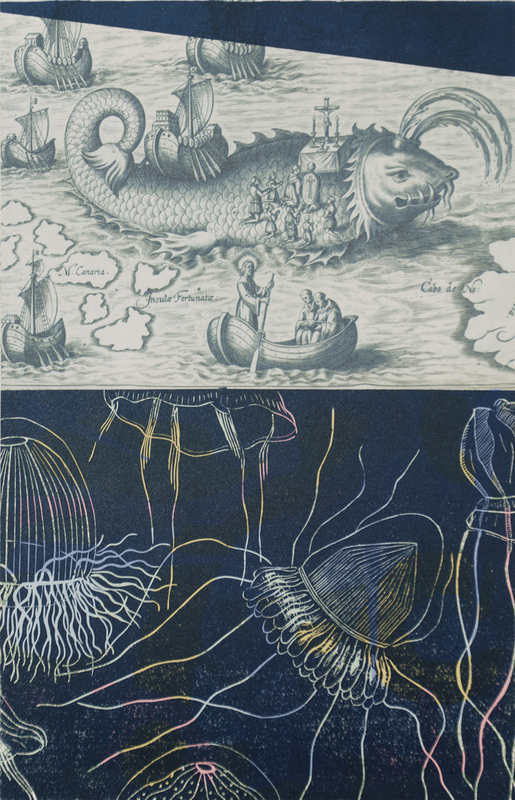 The Postdigital Printmaker is a very interesting blog that shares the work of printmakers who have taken up the challenge of incorporating emerging technologies into their artistic practices. I was honored to have my work included on this blog. Phyllis Merriam, who owns the Postdigital Printmaker blog, saw my book, Apocalypse, at the International Center for the Print. 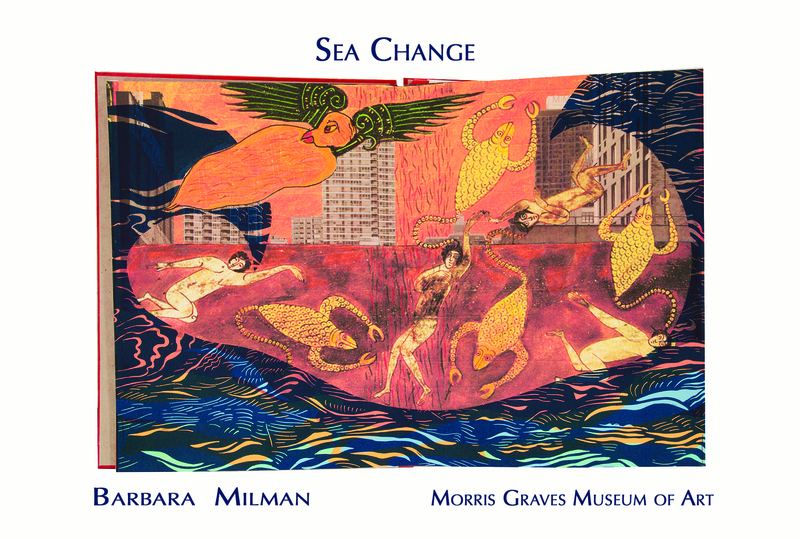 My solo show at the Morris Graves Museum in Eureka, CA in August, 2016 was a big success. There is a large and enthusiastic art community in Eureka, and hundreds of people showed up for the opening night for my show and for another show in the same museum. It is a lovely museum in an renovated old mansion in downtown Eureka. If you ever find yourself in the area, be sure to visit. I was thrilled to have one of my most recent artist’s books in “Commedia: New Prints 2015/Autumn” show at the International Print Center in New York City. KV: Describe your studio to us. What kind of place is it? BAM: My studio is in what was a garage, just steps from my front door. It is sunny, sometimes organized, usually peaceful, a separate room of my own. KV: Do you have a favorite piece of artwork (by someone else) in your home? Tell us about it. BAM: My favorites change frequently. 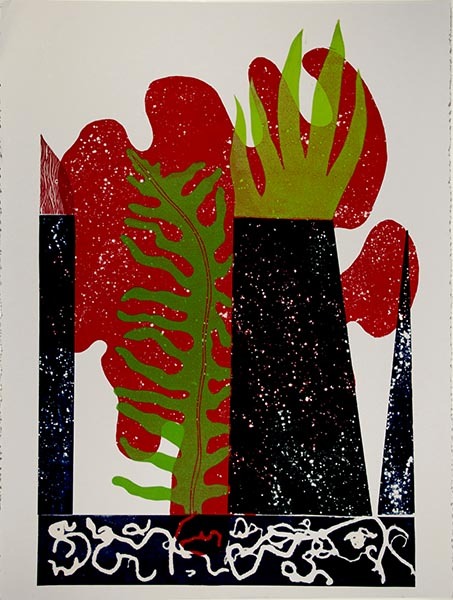 One is a woodcut by Caryl Somers, a beautiful, semi-abstract (probably a landscape) image with a large red mountain (or maybe a bird) that dominates the picture. KV: Which artists, writers, or performers have been influencing you most recently? BAM: Elizabeth Kolbert (The Sixth Extinction); Lisa Ann Gershwin (Stung! 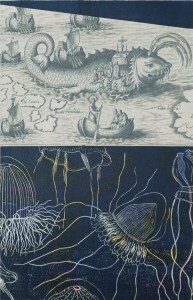 On Jellyfish Blooms and the Futuree of the Ocean) and JS Bach. KV: Tell me about a moment when you had an artistic breakthrough. What led up to it, and what did you notice? BAM: Many years ago I took a life painting class. The professor told us that we did not have to copy the model and the studio exactly, because when we were done the model would leave, and no one would every know if the painting looked just like the model. That comment made me realize that we only imagine there are rules for making art. But making art freely, in your own way, inventively and unconstrained, is actually much more difficult than following conventiona l rules. KV: When did you begin making art on a regular basis? And what drew you into it? BAM: I always loved making art, starting when I was very young. As far as I was concerned, there were very few things that were as much fun as making art. However, for reasons that are not very clear to me today, I took a 25 year detour to become a lawyer, doing art only in my spare time. In 1994 I quit my legal job and became a full time artist. It made me happier, and, according to my husband, it also made me a nicer and more relaxed person. KV: Why do you combine printmaking media with direct media in your work? BAM: I love the way printmaking can be used as a matrix for an artwork. Print elements can be combined and arranged in so many different ways, with or without other elements. Like a puzzle. Or legos. And although the print element can be repeated, adding other elements, particularly other media like drawing or digital images, means that their are endless possible variations for each print. Although I sometimes make very small editions of my work, adding hand-drawn elements to a work, or rearranging separate components of a print, means that each print in a series is different from the others. And for someone like me who does not have the patience to create an edition of many identical prints, the freedom to change each work is very appealing. Direct media allows me to introduce a unique element into each print, complementing the repeated element of printmaking. The result is I more often do “variations on a theme” than an edition of identical prints. I like this because it makes each print a challenge. BAM: Sometimes it emphasizes one aspect of a print, particularly when I add digital images or text. The message is simple: think about how the world is changing because of what we humans are doing to it. BAM: I grew up on Long Island, near the Atlantic ocean. One of the great pleasures of my childhood was going to the beach, walking in the dunes, swimming in the waves. For the past 30 years I have lived near the Pacific Ocean, which is different but equally wonderful. It seems almost impossible that our actions can affect anything as vast as the oceans — unfortunately it is increasingly clear that we are slowly destroying the life of ocean. KV: You also have worked extensively in book arts. What is it about the format of the book that you find most inspiring for your artwork? BAM: Artist’s books are a special genre, somewhere between regular books, fine art prints, and mixed media art. Like fine art prints, they may be made as unique art works or in limited hand printed numbered editions. Like mixed media art, they can take any vaguely book-like form that an artist can invent. And like most books, they may tell a story or impart information. I like the narrative aspect of artist book,s, and the fact that there are no rules. KV: You had a career in law before you became an artist. Have you had any careers other than law and art? Has your legal experience influenced your art? Working as a criminal defense, civil rights and political lawyer taught me the value of persistence even when the deck seems stacked against you. That is a useful skill for an artist.